Something happened in the darkness of Gettysburg--something that scarred Ronan Lynch for life. Now, years later, he wanders the West finding trouble and generally shooting it for a price. But things are about to get strange in the snowy Rockies. There he meets new allies and a deadly threat that's been around for a long, long time. This chance encounter will change him-and what's left of his life--forever. 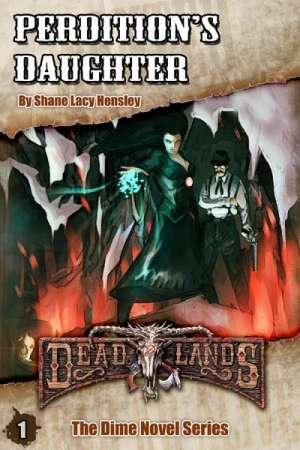 This is the first Dime Novel in the legendary Deadlands series, setting up the adventures of Ronan Lynch, Bad Luck Betty, and Velvet Van Helter. It contains the fiction of the original and all new art. These new editions of the Dime Novels do not contain an adventure for the Deadlands Roleplaying Game. This title was added to our catalog on June 09, 2011.